The Yurt builders at the yurt workshop know how to make a yurt frame. Research and testing, comparisons and more testing mean we know how the best frames are to be made. When buying your yurt be sure to realise the significant differences in what is being offered. Authentic look, the inclusion of the special features that give our yurts a significant advantage, quality materials, lasting craftsmanship and attention to detail are what make our yurt exceptional value. Find out more about What You Get with each Yurt. Because our aim is to make high quality and beautiful yurts we choose the best materials for the job. The woods we choose are selected from the best on offer; oak, chestnut and pine form the structural components. Oak is used for the crown as it exceptionally strong and resistant to the elements. The beautiful strong, yet light chestnut means the frame is strong and attractive. Pine door frames are sturdy and secure. This combination provides an exceptional yurt frame. In general, all our yurts are made with chestnut walls and roof. Chestnut wood is extremely durable and has a high strength to weight ratio thus making them perfect candidates for yurt frames. The Yurt walls come in collapsible sections that tie together with the traditional black ties. Made from sweet chestnut stripped and steam bent to give the characteristic gentle curve and are tied together to form the trellis. The chestnut or ash is oiled to finish. Our walls are exceptionally strong and tie tight to give a resultant strong Yurt. Above the trellis, the chestnut roof poles join at the crown. Each end is shaped to fit the mortise in the crown and the other hand has a bridle to slide over the wall tops. Made from solid oak the crown is made with the traditional 8 spoke Mongol design. The outer ring contains the mortices for the uni to attach to it. 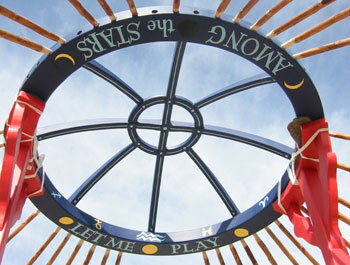 Each crown is lovingly prepared, finished in oil or painted and it is the crowning glory of the yurt. The sturdy door frame is made from quality pine to give strength to the structure. Each door frame has no less than 9 handmade steel rings to attach the various ropes necessary for a real ger. Most of our customers ask for a wooden door to fit this frame. We also offer a doorframe and door in oak. Two long poles that attache to the crown. The bagana are there to support the crown and enable it to be pitched with ease. If required we can supply these with the smaller yurt. Free with 18 and 21 foot. Whatever cover you choose the frame is the same high quality as described above. We have been honoured with a commission for a custom built "Special" yurt for Yorkshire's first planetarium, based at Harewood House near Leeds.